This is yet another quick guide on how to claim/receive Galaxy Gifts on your Samsung Galaxy Tab S.
After you purchased a new Samsung Galaxy device -- smartphone or tablet, including the Galaxy Tab S, from a participating retailer, you will be given exclusive access to movie, music or fitness content, as well as meaningful rewards for the world's leading brands that would make your Galaxy Tab S experience even more enjoyable and productive. Among the Galaxy Gifts (exclusive) items you can get would include news and a wide range of productivity applications, for free on your Galaxy device. 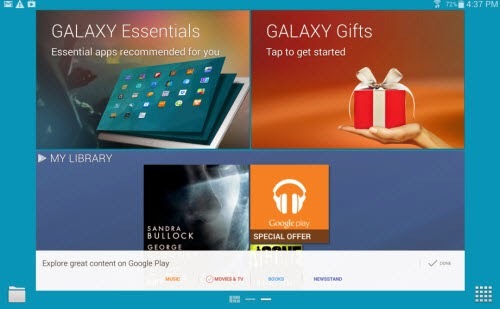 Here's how to get Galaxy Gifts on your Samsung Galaxy Tab S.
1. Turn your tablet ON. 2. Swipe your finger left or right of the screen until you get to the Galaxy Gifts widget. 3. Now tap on the Galaxy Gifts widget. You will then be prompted with a pop-up menu. 4. You may choose to download all apps shown by touching the Download All button or select some of them by touching the Download icon next to the app you want to get. You will be prompted with a log-in popup, if you haven't yet signed in or up for a Samsung account during the initial setup screen. You would need to sign in to your Samsung account before you can download the available apps as your Galaxy Gifts offers. Take advantage of these exclusive offers, and make the most of your new Samsung Galaxy Tab S.